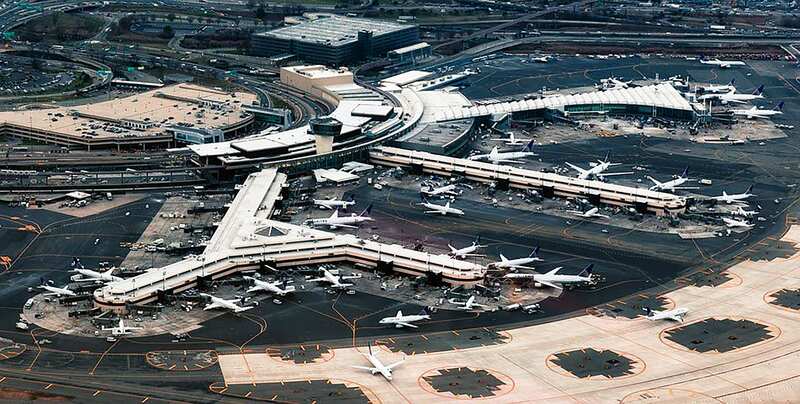 Which NYC Airport Should You Choose: LGA, JFK, or EWR? Flying into New York City for the first time is exciting. Heck, I still get a little thrill when the plane banks and I see that iconic skyline. But New York is the busiest airport system in the US—and it shows. Getting to and from JFK, LGA, and Newark isn’t awesome, especially if you assume that everything will be fine. It won’t. Expensive cabs, confusing subway lines, construction, massive delays, and constantly changing fares makes it tough to choose the right NYC airport. 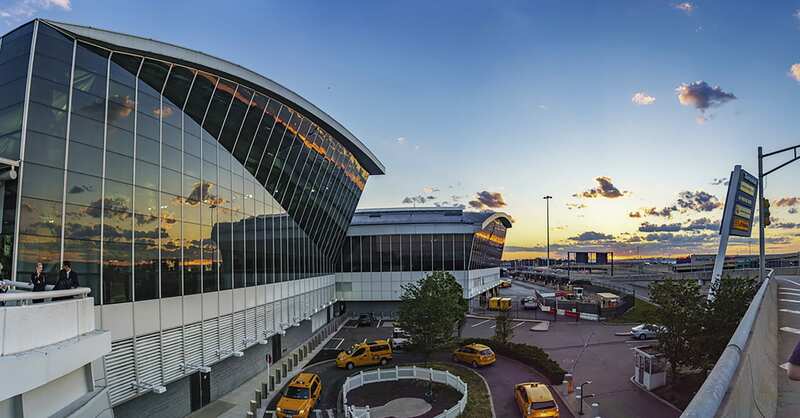 And while every trip and every budget are different, there’s usually a right answers to the question, “Which NYC airport should I choose?” And there’s no one answer to, “Which airport is closest to NYC?” Because it’s a big place, and it depends on where you’re going after you land. Here’s a look at the logistics of landing at each NYC airport, and the pros and cons of JFK, LaGuardia, and Newark. Hopefully it helps you navigate the chaos. Some people understand the NYC subway and some people don’t. Personally, I don’t understand what’s so confusing about it, but, for some people, it is. I’m not here to judge. 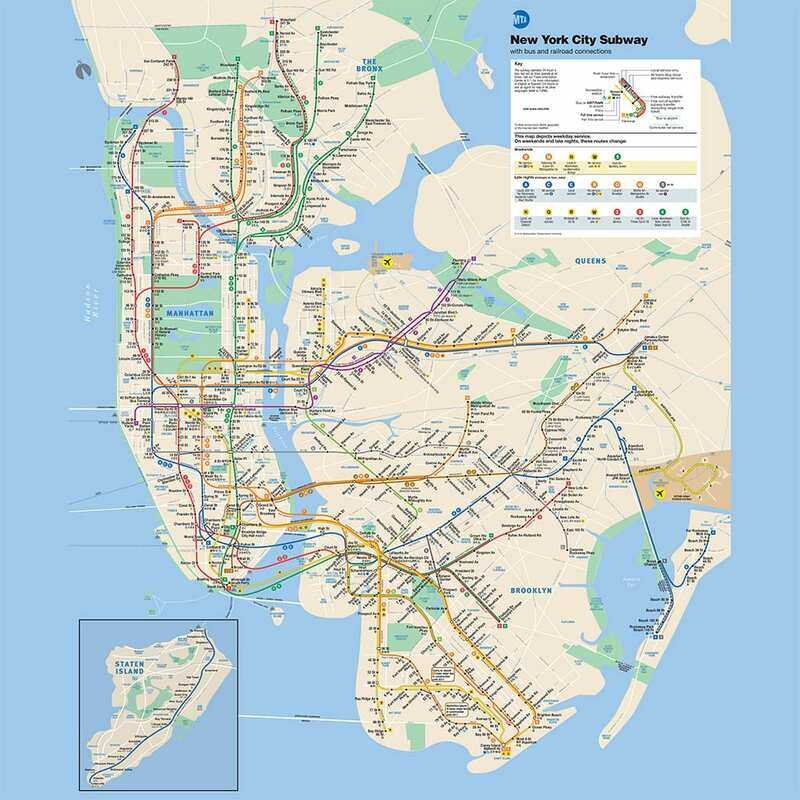 If the colorful MTA subway map looks like the fever dream of a preschool finger painting don’t use the subway to get to the airport. It’s not for you, and that’s ok.
Taxis, ride shares, and even shuttle buses will get you to the airport. It’ll just cost another $40. If you still want to risk it, plan your trip on Google maps (it’s what I use). But remember, NYC is a chaos sometimes, so check on the status of your train and don’t be surprised if your line isn’t running after 11pm (it happens) or it’s under construction. (NYC infrastructure is a mess right now). Looking at a map of New York, it’s easy to assume that everything is pretty close to each other. Manhattan is only 12 miles long, and New Jersey is just over the river. It must all be connected, right? Not even a little bit. I’ve lived in NYC on and off for over 10 years and I’ve been to the Bronx twice (once for a Yankee game) and Staten Island once (on the ferry). I can’t tell you the last time I’ve been to Queens, but it wasn’t in 2018. Thing is, I have nothing against these boroughs. They’re just too danged far away. It would take me well over an hour to get from my house in Brooklyn to any of these spots. And most are within a few miles. It’s just the way the city is built. So don’t assume that your final destination is close to your airport of choice just by looking at a map. Do the math. Then add 30 minutes. 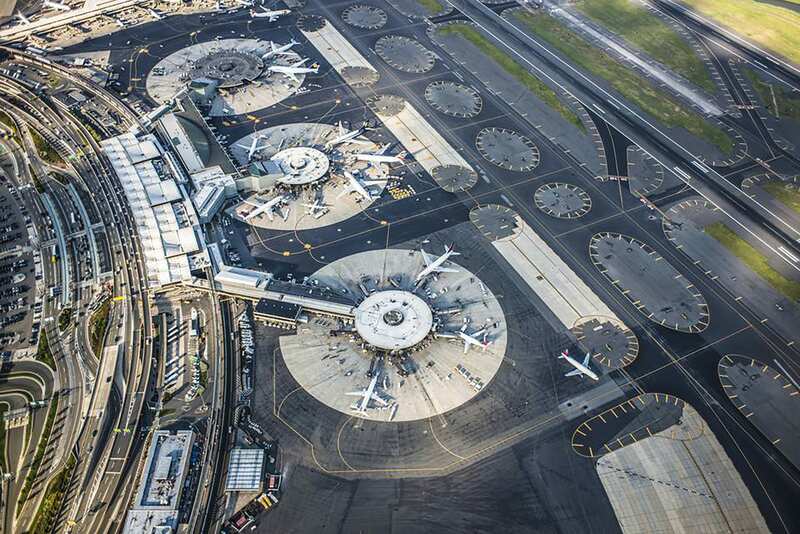 59 million people landed at JFK in 2016, so if you like crowds (you’re visiting NYC so you obviously do) get excited to land at one of the busiest airports in America. The good news is that JFK is built to handle volume. The terminals are modern(ish), the infrastructure is decent, and of all the NYC airport options, JFK is the most accessible via public transportation. Everyone says it takes an hour to get to JFK from Manhattan, but that’s only if the stars align. I always allow 90 minutes to get to JFK on the train, and 30-40 minutes if I take a cab or car. If you’re in town for a few days, don’t try to save money by taking the subway to/from the airport. Bite the bullet and pony up $60 for a cab or a Lyft. However, if you’ve got time to spare or want to save $50, by all means take the subway. The A and E trains (that’s the blue line) both service JFK to/from Manhattan, Brooklyn, and Queens, but you have to connect to the AirTrain to go the final mile. Transfer to the AirTrain at Howard Beach Station (A train) or Jamaica Station (E train). Tip: If you take the A train to JFK make sure you do not take the Lefferts bound A train. For some inexplicable reason the A train that goes to JFK has a weird detour. The Howard Beach/Rockaway bound A train goes to JFK. The Lefferts Blvd. A train doesn’t. The Lefferts Blvd stop is a random little culdesac on the A subway line that juuuuuuuust dips into Brooklyn. It goes three stops and turns around. And it makes zero sense. Don’t take the Lefferts train to the airport. You’ll waste a lot of time backtracking to the right train. Taxi = $60: If you land late at night and luck out with construction and traffic it can be closer to $40 (depending on your destination). But traffic can make it $70 in a heartbeat. Lyft = $45-60: A Lyft pool can save you about $15, but be careful about that arrival time if you take a pool. JFK detours are pretty common. Bus = N/A: I’ve never heard of anyone taking a shuttle bus to JFK. If you do, let me know. Honestly, who cares about airport “amenities?” I mean, really? Either you’re some kind of diamond-ultra-plus-extra airport lounge member or you’re just another jetlagged, bleary-eyed transit hobo searching for an outlet. And you’re probably wearing UGG boots. And no one in New York cares. If you’re at JFK super late, Terminal 1 has 24 hour dining options. So that’s cool. And Boingo offers “complimentary wi-fi” which basically means nothing. Once you’re through the terminal, all NYC airports are basically the same. They have food, coffee, alcohol, overpriced bluetooth headphones, Dan Brown novels, and Annie’s Pretzels. There are always pretzels. And if you didn’t get your “I Heart NY” t-shirt they’re a bargain at $38 a pop. JFK is a major hub that serves basically every destination in the world including Iceland (you used to have to fly from Boston). If you want to fly to Europe direct, fly from JFK. LaGuardia is the dark horse of NYC airports. It’s closer to Manhattan than JFK or Newark (about 8.5 miles compared to 15 and 16 miles), but it’s somehow doesn’t feel very close. And that’s all thanks to the NYC Taxi Lobby. Without getting into it, the NYC Taxi Union worked really hard to keep LGA from getting a subway connection in the 1970s. That means the subway lines stop about a mile from the airport. Aren’t special interest groups awesome? If you want to get to LGA via public transit you have to take the subway, walk a few block, transfer to a bus, then hopefully get out at the right terminal. If that doesn’t sound like fun, you can take a taxi or rideshare service. Funny how that works out. The only problem with driving to LGA is that it’s undergoing massive upgrades to basically every single terminal. It’s going to look amazing—in about 5 years. Until then, get ready for construction delays and expensive cab fares. Subway + Bus transfer = $2.75: But if you’ve got a big bag or you’re in a hurry, it’s not worth it. LGA is a little smaller than JFK, but that’s like saying LeBron James isn’t as tall as Shaq. Of course he’s not, but he can still dunk on everyone you’ve ever met. LGA is big and flies everywhere. Pay super close attention to your terminal—especially if you’re on the bus. LGA is really really spread out. It takes 15 mins to walk from one terminal to another, and there’s no shuttle or tram or anything. If you have to transfer terminals or your terminal changes last minute you’re in for a schlepp. Yes, Newark is technically a “New York City” airport even though it’s in a different state. And it’s about the same distance from Manhattan as JFK, so it’s easy to assume that flying into Newark is the same as flying into JFK. But you couldn’t be more wrong. Newark is notoriously difficult to get to using the subway and NJ Transit, and a taxi routinely costs $70-100. It has to do with the fare to get into the city ($15+) and traffic on the bridges and tunnels. I don’t usually fly into Newark because it’s just too danged far with too many variables. A flight has to be at least $200 cheaper for me to even consider flying into EWR. The one exception to my Newark hate is the Newark Airport Express shuttle bus. This marvel of janky bus travel once got me from Penn Station to my terminal at Newark in 17 minutes. I know that sounds impossible, and it is—but it happened. The express bus costs $18 (one-way) and runs from 4:45 – 2am (it start at 4:15am from EWR). It stops at Port Authority, Grand Central, and Bryant Park and doesn’t stop anywhere else. If you like that bus from Harry Potter, you’ll love the Newark Airport Express. Honestly, I’ve tried getting to Newark on the train and it’s just a confusing nightmare. All of the stops are named Penn Station (there’s one in NJ too), and you have to transfer at least three times from more places in NYC. If you’re rich take a cab, if you’re broke take the bus. Newark Airport Express Shuttle Bus $18 one-way ($30 roundtrip): Fast, cheap, and sketchy is the only way to get to Newark. Taxi/Rideshare = $70-100: You have to pay bridge tolls, and traffic can be murder. Subway and NJ Transit = $12.50 + $2.75 (MTA): It seems like the NJ AirTrain is getting better, but I just can’t manage to use it. Bus all the way! Newark typically pops up as a slightly cheaper flight option than JFK or LGA, but there’s a reason you save $40 or $50 on a flight to Newark. Tolls and crappy flight times. Whenever you drive into the city of New York (from the New Jersey side), you have to pay a toll. And it’s a nasty toll—$15 to $17 per car depending on which bridge you use. When you take a taxi, that toll gets slapped onto the price of your fare. Both ways. 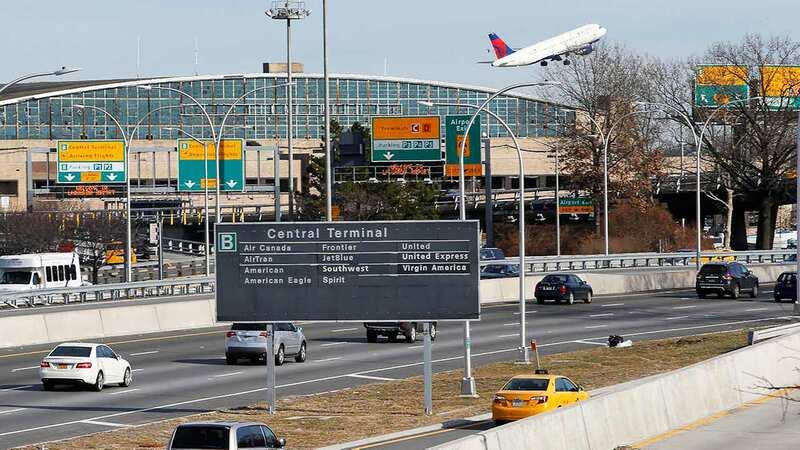 If you want to pay steep tolls or leave for the airport at 3am, fly out of Newark airport. Flying into NYC is always going to be difficult. But if you know how you’re going to get from A to B, where you’re staying, and what your budget is, you’ll be fine. Just stay away from New Jersey.